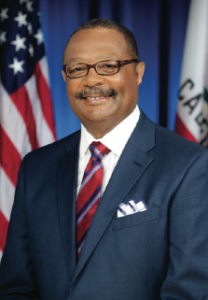 Jones-Sawyer’s bill has been sponsored by groups such as The Labor Community Strategy Center and the Youth Justice Coalition, both based in Los Angeles, and the national Children’s Defense Fund. These groups advocate moving away from zero-tolerance discipline policies toward dealing with the root causes of bad behavior. More counselors, not more police, are what is needed, they say. Many schools, particularly high schools, have full-time police on campus. Often it is not clear when a misbehaving student crosses the line into criminal activity. But if police do get involved in routine disciplinary matters, students are more likely to end up in the juvenile justice system than if the issue were handled by a counselor or administrator, advocates say. 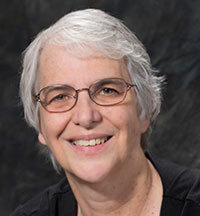 “After the Sandy Hook shootings, we wanted to get ahead of some of the more harmful proposals,” said Zoe Rawson, a spokesperson for the Community Rights Campaign, which is part of the The Labor Community Strategy Center. In an article on the website of the Center for Public Integrity, an investigative news organization, Jones-Sawyer explains why he introduced the bill. “There should be guidelines for when you don’t need police involved in discipline,” he said. However, the bill has been substantially changed by the Assembly Appropriations Committee and has met with resistance from the Association of California School Administrators. Laura Preston, a lobbyist with the group, says the bill limits the decision-making ability of administrators and that the language outlining police roles does not belong in school safety plans, which describe what should occur during an emergency. The original bill would have required districts to rely on more positive approaches to discipline, such as restorative justice, and outline specific instances, such as dangerous situations, in which police could become involved in student cases. However, that requirement was amended in the Appropriations Committee before being heard on the Assembly floor. With the changes, the bill, which passed the Assembly on a 71-0 vote on Wednesday, now “would encourage comprehensive school safety plans to include clear guidelines” for the roles of counselors, administrators, teachers, school police and local police. Braeden Weygandt, legislative analyst with Warner & Pank, a consulting group that represents the California Sheriff’s Association, said the association has taken no position on AB 549. John Lovell, lobbyist for the California Police Chiefs Association, did not return messages requesting the association’s position on the bill. The bill may not seem important to those living in communities where police are present only when they have been called for help. But students who live in crime- and gang-ridden neighborhoods look to school as a place to escape the violence and police presence, one advocate said. 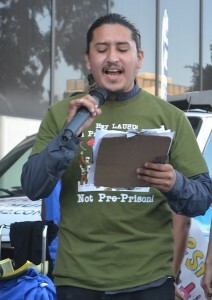 Carlos “Elmo” Gomez is an organizer with the Community Rights Campaign. He recalls his first high school in Los Angeles, which had a heavy police presence. Students, who were regularly pulled over and questioned by police in their neighborhood, did their best to avoid the school police, he said. “You would not go to them if something is wrong, even if it’s life threatening,” he said. Looking back, he said, “it felt like we were under occupation because it was not just my school that was heavily policed, it was the community.” If students got in a fight, police got involved and the situation became a criminal one, he said. When Gomez was shot at during school, he had a pretty good idea of who had done it, but he knew if he told police his suspicions, it would have put him, his family and his friends at risk in his neighborhood. So he remained quiet. “They should have had intervention support, should have had peace builders,” he said. The bullets left three holes in his shirt sleeve, but neither he nor anyone else was injured. More importantly, there were no police on the campus even though Central was also located in a community with high violence. He remembers a policeman knocking on the door of his classroom, asking to speak to one of the students. The teacher told the policeman that no guns were allowed on campus, including his, and that he needed to talk to the student after school. The teacher then shut the door. Ruth, thanks for your reply. Having served in the classroom for several years, and taught a number of students who were on probation, as well as a few who had spent time in Juvenile Hall, I understand how the system works. When addressing teachers, you will get farther if you remember that we are the ones on the front lines: we’ve seen it, in ways that you cannot, as a staff attorney in a foundation. I checked with the California Commission on Teacher Credentialing; if you ever did teach in a California public school, you did so many decades ago, as there are no electronic records of credentials in your name. I would point out that, in addition to being a teacher, I have an MBA, and a keen interest in law. I am not an attorney, of course, but I am not an uninitiate either. Advocates of striking 48900(k) get very nervous whenever I bring up 48910(a), the rather enlightened in-school suspension provision that also depends on 48900. At least you admit, unlike the author of the Center for Public Integrity article, that AB 459 would block in-school suspension as well as out-of-school suspension for defiance/disruption. Regarding AB 420, I understand restorative justice and other alternatives, but would note that, without 48900(k), it would be illegal to remove the student from the classroom (to be clear: out-of-class, in-school) for a “willfull defiance/disruption” incident. This has several consequences. First, a single student can effectively stop instruction, but it is illegal for me to remove the student from the room. Second, all interventions must happen outside of class time, where the in-school suspension provision allowed an administrator to begin working with the student during the class period. I don’t believe that Public Counsel has proposed a mechanism to compensate teachers for extra after-school time spent on restorative justice, etc. The reference to AB 459 should be to AB 420 instead. Paul, I appreciate your concerns, but as a community we must understand the logical consequences of policies that inappropriately criminalize and exclude young people from educational opportunity. When students are arrested for the offenses you list (marijuana possession, vandalism and public fighting) they are referred to a juvenile criminal system that does little to nothing to respond to the root causes of the incident. Additionally, after their arrest, they will not be seen in court for months so they will return to school (unless they are recommended for expulsion for the underlying incident) with no assistance/attempt to repair the community harm. Efforts like AB459 are working to ensure that we create appropriate school community responses to these incidents. I support attempts to treat the disease, not merely the symptoms, to use a medical metaphor. Counseling and social services are important. Nevertheless, some of the offenses listed, namely “vandalism …, marijuana … possession, … and public fighting”, cannot be written off as “minor”. The Public Integrity article also errs in claiming that A.B. 420 — aptly numbered — would merely limit out-of-school suspensions for “willfull defiance”. In fact, by amending CA Ed Code 48900(k), upon which the in-school suspension provision also depends, the bill would block in-school suspensions as well. School site administration is an exercise in public relations, and I’ve taught in schools where progressive, incompetent or negligent principals made themselves look good by not reporting serious offenses to local police. Inevitably, the strategy backfired. New and more serious offenses occurred when the perpetrators discovered that there were no real consequences. Kids aren’t dumb. The veil of secrecy was also troubling. Citing confidentiality, these administrators hid disciplinary information from teachers. In some cases, offenses were not even logged. If I’m teaching a violent student, a drug abuser, or a vandal, I want to know what to watch for. This society is quick fast and in a hurry to lock up our Black and Brown youth, why I ask myself it is because this system of things has been so oppressive they don’t want them educated and have the ability to fight back.They want them to meek and docile the fact of the matter is if you do a horrible thing long enough people will assume its normal. We should by all means being preparing our youth for their time as adults, decision makers, learn by example of medator and counciling restorative justice practices the ablity to solve problem without wars and incarceration. Our young of color should have the ability for governance for all the people and by all the people. AB549 is a step in that effort. The policies have not made schools safer. However, by criminalizing routine disciplinary problems, they have damaged the lives of many children by making them more likely to drop out and entangling them, sometimes permanently, in the criminal justice system.